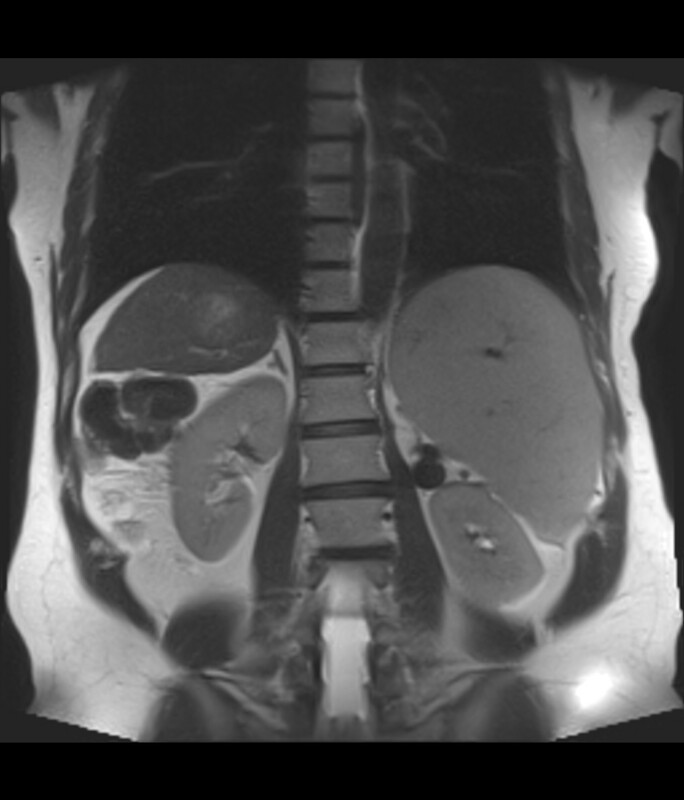 This 54 year old woman presented to the gastroenterology clinic complaining of abdominal pain. A right upper quadrant ultrasound was performed demonstrating an ill-defined hypoechoic hepatic mass. 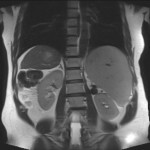 MRI was recommended for further evaluation. 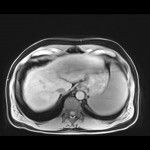 Abdominal MRI was performed on a 3T MR system (Skyra, Siemens). (A) Coronal T2-weighted HASTE (TR/TE 1400/87ms) and (B) Axial T2 TSE fat sat (TR/TE 4618.7/101.0ms) images were acquired along with (C-F) T1-weighted VIBE (TR/TE 4.1/1.9, acquisition time 19 sec) images (C) pre-contrast and post-contrast in (D) arterial, (E) venous and (F) delayed phases. 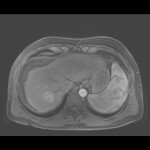 20 cc of Multihance were used. 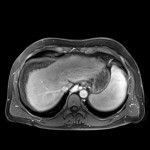 The liver is decreased in size with a nodular contour, consistent with cirrhosis. 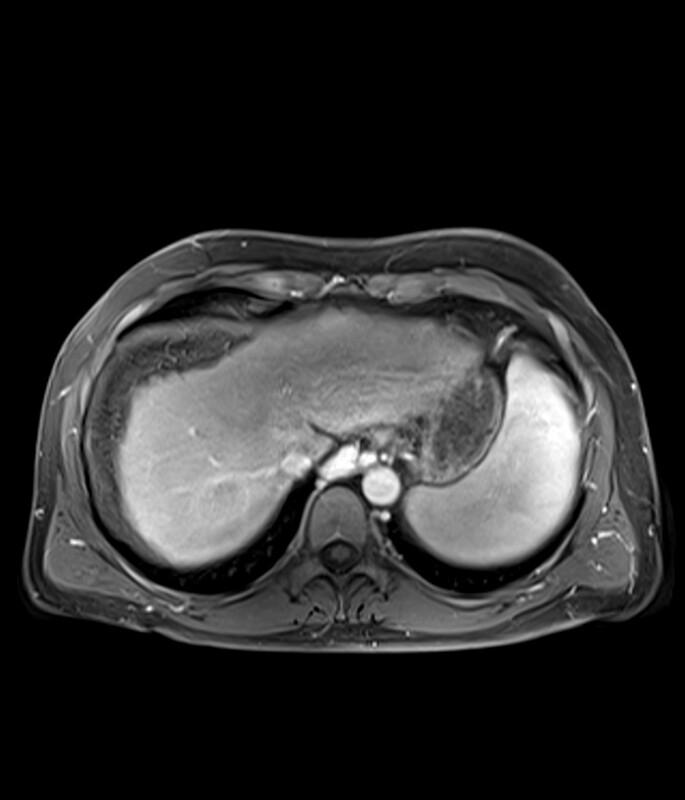 The presence of splenomegaly also suggests portal hypertension; although, the portosystemic varicosities which were present are not well-demonstrated on the provided images. 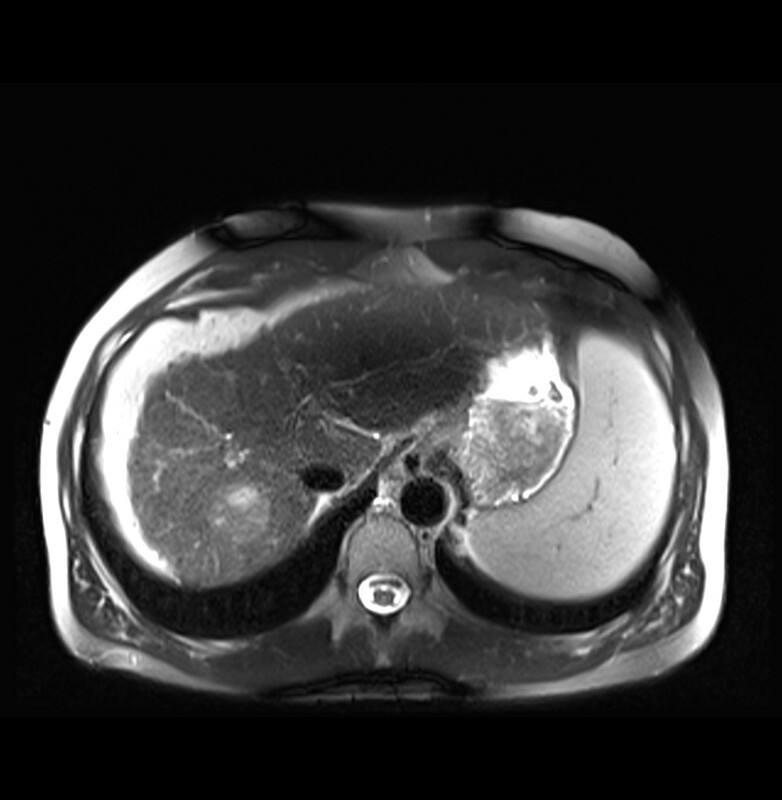 A hepatic mass is noted within segment VII of the liver demonstrating mixed iso- and hyperintense signal relative to hepatic parenchyma on T2-weighted images. The mass is not well-seen on pre-contrast T1-weighted images. 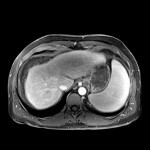 After contrast administration the mass exhibits avid arterial-phase enhancement with an internal area of diminished enhancement. 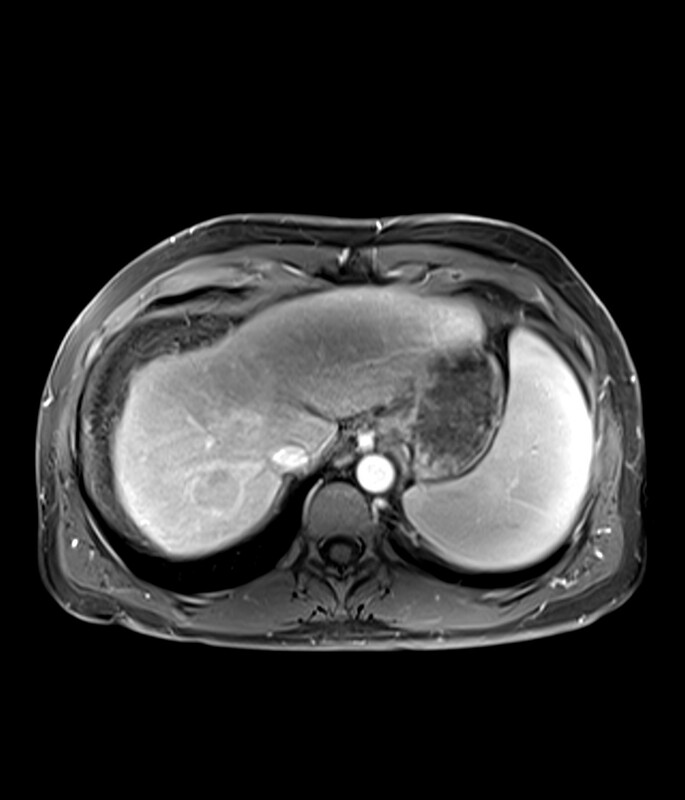 The latter region corresponds to an area of increased signal on T2-weighted images, consistent with an area of central necrosis. There is enhancement washout on delayed images. 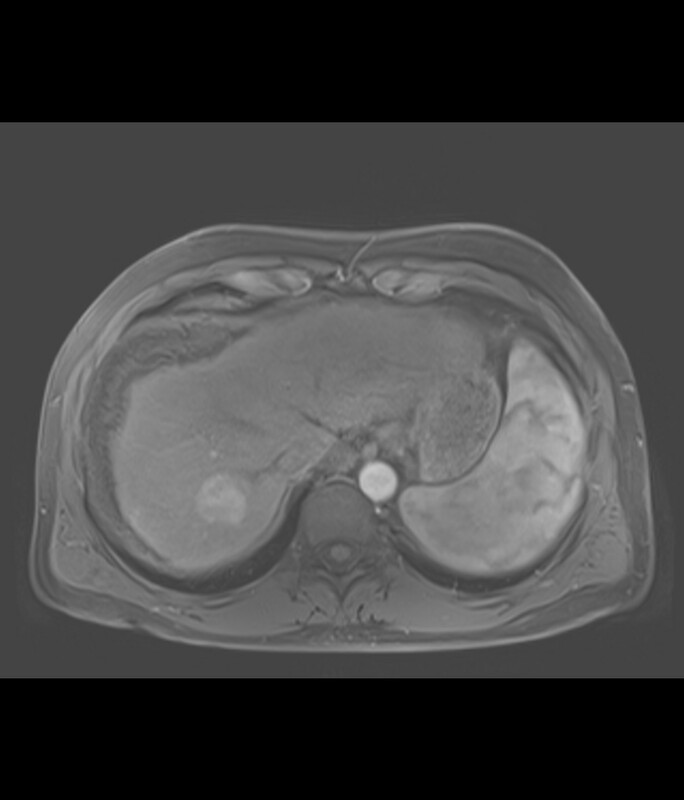 This constellation of findings is typical of hepatocellular carcinoma.